While I don't encourage visitors to drive in New York City, there are certain times when it cannot be avoided or ultimately makes sense for your trip. 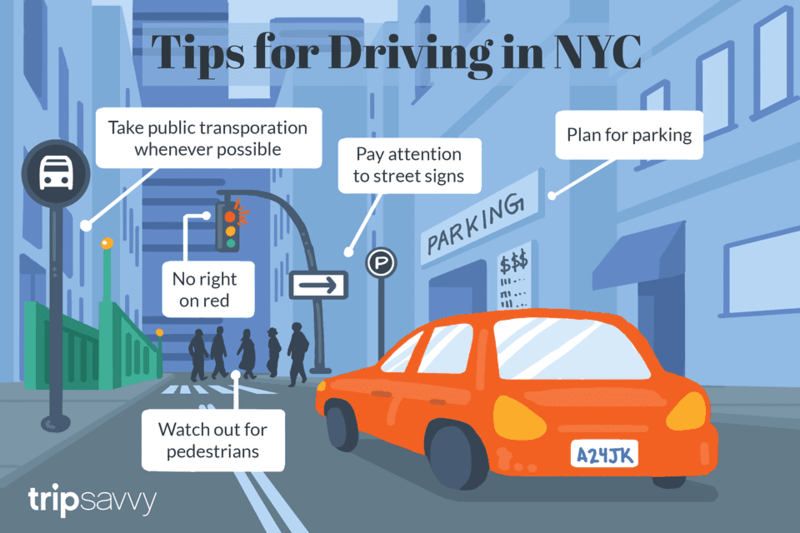 These tips will help you save on parking, avoid getting tickets and make driving easier and safer if you're unfamiliar with driving in New York City. Most visitors to New York City will be better served by taking a train, bus, or plane into New York City. Once you're in the city, most people find that they don't need a car, because you can easily take taxis or the subway to get where you're going. The cost of parking your car adds up quickly, especially if you'll be visiting for several days, and driving your own car around New York City rarely makes sense. If you have still decided to drive in New York City, you should be aware that unlike nearly every other place in the U.S., you cannot make a right on red (except in the rare instances where there is a sign indicating you can). There are many major avenues where you can't make a left turn during certain hours, so keep an eye out for signs. These rules are designed to limit congestion at busy intersections, and the police will ticket you if you get caught making an illegal turn. People are everywhere in New York City. While it might be illegal to jaywalk, people still do it, so keep your eyes out for people wherever you are driving, whether you're near a crosswalk or not. New York City has replaced the old parking meters that only accepted quarters with muni-meters, which is nice when you don't have quarters, but it's a little more of a hassle to go to the nearest meter, pay (with quarters, dollar coins or credit card) and then put the ticket on your dashboard to show you've paid. This makes it harder to game the system, but you can move your car and continue to use the same ticket (in the same borough) if there is still time remaining on it. It's amazing how one parking garage can charge one rate and across the street, the price will be entirely different. My favorite way to plan for parking in New York City is to go to the NYC Bestparking website. Enter your arrival and departure date and times, as well as the location and the site gives lots of great options for parking with prices. Be sure to write down the street address of the lot you pick, because there are often lots right next to each other and the prices can differ wildly. At many parking garages they'll have a sign that says something like "$5 All Day" but in tiny print, it says "up to half an hour." Depending on where you are, you'll find that rates often "top out" after just a few hours, so parking somewhere for 3 hours costs the same as parking there for 8 hours. Don't be afraid to ask the parking attendant about rates and whether they accept credit cards for payment (some parking lots are cash-only). When you see an empty block, there is often a good reason that people aren't parked there. Whether it's street cleaning or a loading zone, street parking in Manhattan is at a premium, so it's rare to see many spots available and that should tip you off to pay special attention to the parking rules posted on street signs. There are even meters where you can't park for several hours a day (often during rush hour) so even parking at (& paying) a meter doesn't give you a free pass. You need to stay 15 feet away from fire hydrants when you park on the street. And they will ticket (or tow) you if you're parked within 15 feet of the fire hydrant. For crosswalks, make sure your tires are located entirely outside of the crosswalk markings or you run the risk of getting a ticket. It's way cheaper to pay for (often overpriced) parking in a lot than to risk getting your car towed. Not only are the lots where they tow your car inconveniently located (sometimes they'll tow your car to Brooklyn even though it's parked in Manhattan), they charge more than $100/day to "store" your car on top of whatever the ticket you got that caused you to be towed in the first place, so it gets expensive quickly. Also, they're often not open on weekends and in the evening, so it can really mess up your plans if you've got to spend another night in New York City so you can get your car back. Whether it's the middle of the night or a Sunday afternoon, if you park illegally, you are very likely to get a ticket. If you are running late and your parking meter runs out, there's also a strong likelihood you'll get a ticket, so give yourself plenty of time on the meter and be sure to make it back to your car before your meter runs out. Pro-tip: set an alarm on your phone if you've left your car at a meter so you don't get a ticket before it expires. If you park in a garage, the claim ticket should have the address of the garage on it, but if you're parked on the street, it can be tough to remember exactly where you parked after a long day in New York City. Write down the address and cross streets where you've parked, send yourself a text message, take a picture with your phone or leave yourself a voicemail to help you remember where your car is parked. What should you do if you can't find your car in New York City and think it's been towed? Call 311. With your license plate, the operator can quickly check the database to let you know where your car has been towed.